Do you feel a call to make a commitment to a different kind of “school,” one that will bring you deeper into knowing about your own woman’s body, heart, mind and soul? If so, plan to join Thérèse and Tere at the Sacred Groves Women’s Mysteries School. 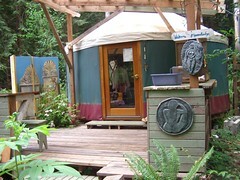 The Sacred Groves Womens Mysteries School consists of a variety of rituals and circles designed to bring women into deeper connection with the wisdom of the body, the nurturing energy of Mother Earth, the potent teachings at each phase of life, and the power of the sisterhood. We guide women to tap into ancient woman-wisdom-within through ceremony, song, heart-sharing, movement, drumming, eating, praying, laughing and playing together. Women’s Red Tent and Red Tent Spa, Every 2-3 months, on a Saturday 2pm – 9:30pm. Includes Spa activities all afternoon, potluck dinner and evening program. Read more here. 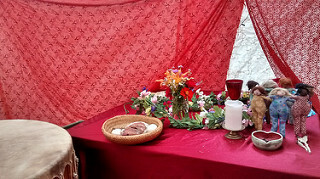 Earth Mothers Circle, 10:30am-4pm, 3rd Sunday each month (2019 exceptions: April is 2nd Sunday –Ap 14, and we do not meet in May and September) Read more here. Women’s Rite at Sacred Groves. May 18-19 Read more here. Holistic Pelvic Care (HPC) , private appointments offered by Thérèse. Read more here. Women of Wisdom Conference (Seattle) February 15-17. Read more here. Womens Summer Solstice June 20-23. Join us and 100 other women and girls for this annual event in the Cascade Mountains, near Cle Elum, WA. There are several ceremonies, including sweatlodges, good food, lots of prayers, laughter and song! Read more here. MoonRise–Becoming a Young Woman for girls age 12-14, July 28-Aug 4, organized by Rite of Passage Journeys, held at Sacred Groves. Read more here. Coming of Age for Girls for girls age 12-14, organized by Rite of Passage Journeys, A two week trip consisting of backpacking, ending with ceremonies at Sacred Groves. To read more about the nature of Women’s Mysteries click here…..
To hear a “Wise Woman Radio” interview with Thérèse (conducted by Susun Weed) about Women’s Mysteries, Click Here. PHOTOS of various Womens Mysteries School activities–click here. Contact Thérèse directly to set up an HPC appointment or for more info about the Womens Mysteries School.